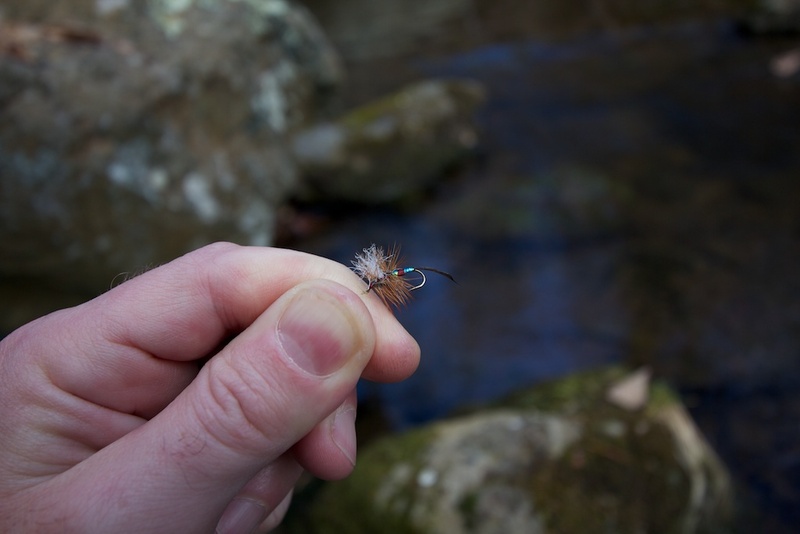 Home » Fishing Reports » Dry Fly Fishing in Shenandoah National Park in January! 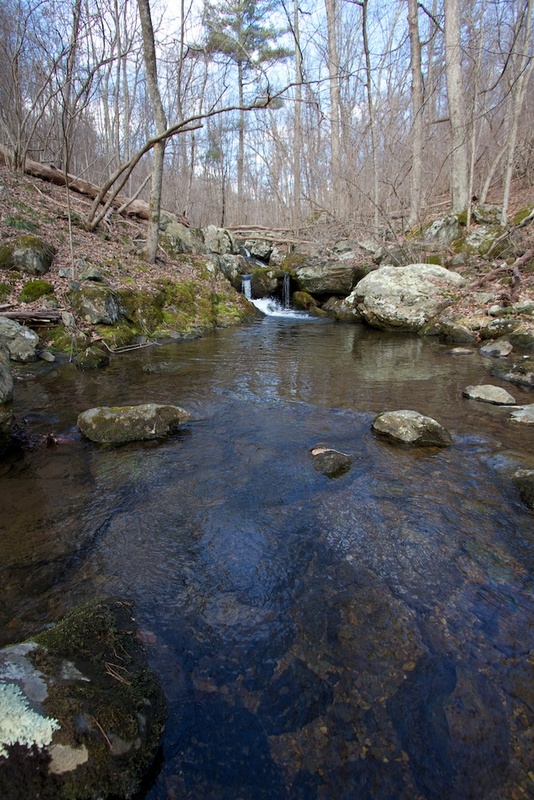 I got out this weekend to one of my favorite streams in Shenandoah National Park. Since it was in the mid-fifties and has been for days, it seemed like it would be worth a shot to once again and per my standard practice SHUN NYMPHING and throw some dry flies, see how I’d do, then pick up some barbeque at Mr. B’s afterwards. 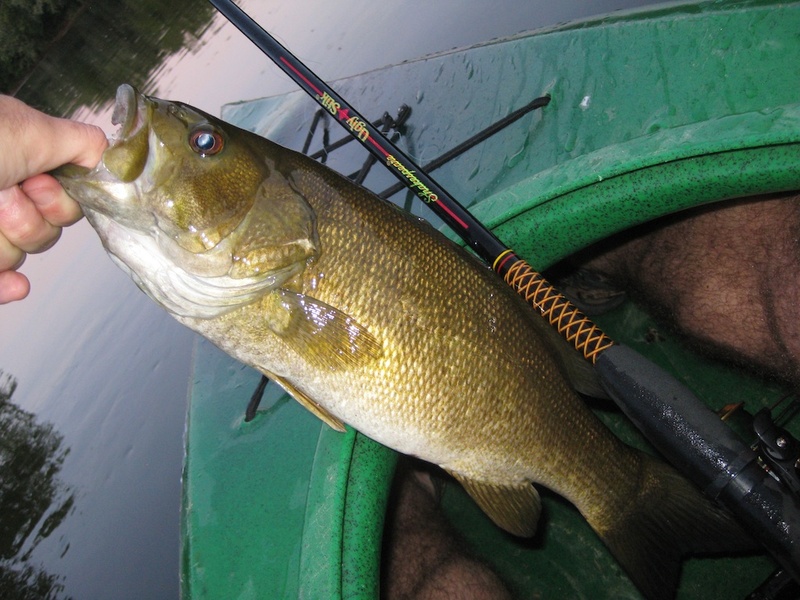 A trip like this involves quite a bit of traveling for the amount of fishing. I don’t live too far from the park but it was still nearly an hour drive each way for this stream. Part of that is due to the 35 mph speed limit on Skyline Drive and getting stuck behind weekenders there who dutifully obey it. Once I parked it was another 45 minute hike downhill and about an hour hike back out. So right off the bat, that’s nearly four hours out of the day just to travel to and from the water. I managed to fish it for about two hours. I could have stayed longer but had to get back home for some reason that seemed important then but I really can’t justify or even remember looking back now. The fishing was awesome! 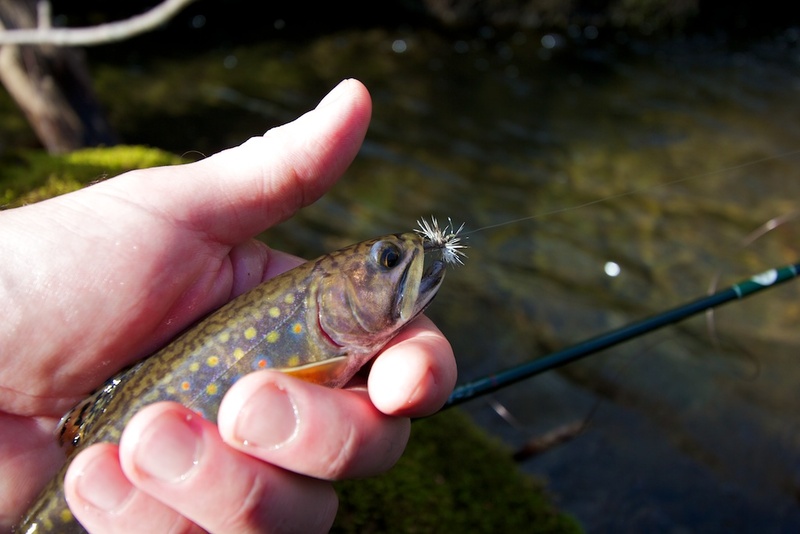 Throwing dry flies and catching trout on the surface in the middle of winter is so much fun. 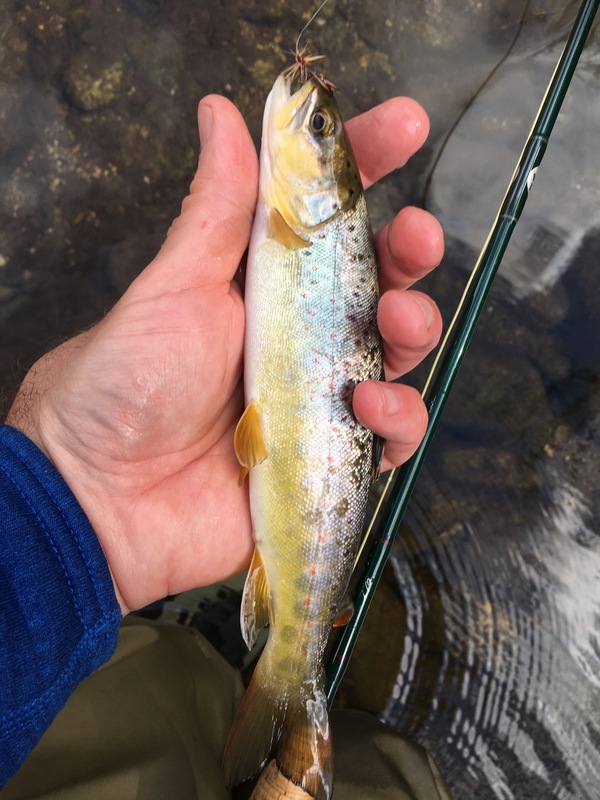 I took a tip from my trip to Florida for redfish last month about sight fishing and decided to really try locating trout before just blindly casting to the seams and other good spots, like I typically do on small streams. I was pretty successful and managed to see many of the fish I caught before I even made the cast. This is a skill I’m going to try to make more of a habit, just slowing down a bit more and really trying to spot anything I can before making even that first cast. So I fished two flies, both of which I tied in the past week. The first was a size 12 Adams “Wulff” I think I’ll call it. I am not a huge fan of tying feathers for wings on dry flies. It just seems like it’s not always necessary. I simply used some synthetic white yarn instead to make a split wing and wrapped it in a ton of brown and grizzly hackle. Seemed to float fine, cast well and fooled fish. Not sure I’ll go back to feathers for Adams style flies any time soon. The hard working Patriot. Still looking pretty good after taking a couple fish. The second fly was a size 12 Patriot. This is the first season I’ve tied this pattern, and it was based on a tip from Paul Kearney who runs the Trout Unlimited fish camp for kids, and who has fished the park for over forty years. I also just got Charles Meck‘s book, Mid-Atlantic Trout Streams and Their Hatches. Charles Meck is the creator of the Patriot dry fly. 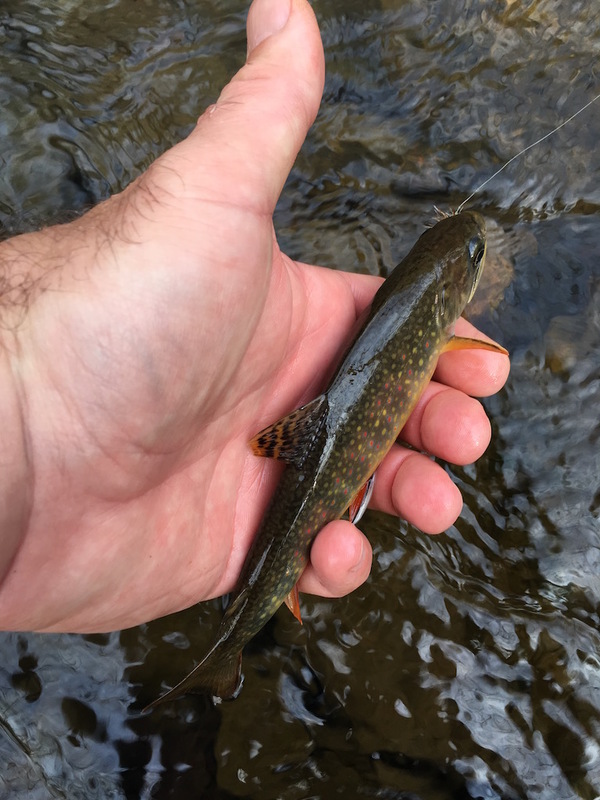 Typical for a brook trout stream, it worked just fine, too! After I caught a fish or two and the fly became soaked, I put aside my principles and drifted it under the surface. Yes, nymphing! I watched several fish rise off the bottom and slurp the waterlogged fly. The first few were with an Adams, the second batch with the soaked and slimed Patriot. A note about wading in winter: I severely limited my wading in the stream on this trip, really just wading on the very edges of the water or on shelves of big rocks and boulders. I avoided walking on the gravel and free stone areas as completely as I could. 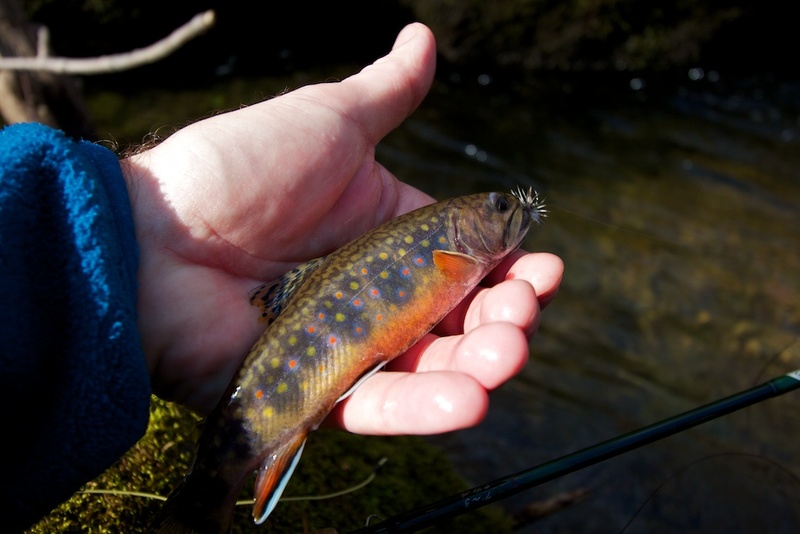 The brook trout have just finished spawning and trampling through the streams, while never a good idea, is much worse of an idea at this time of year. If you do go be very careful. 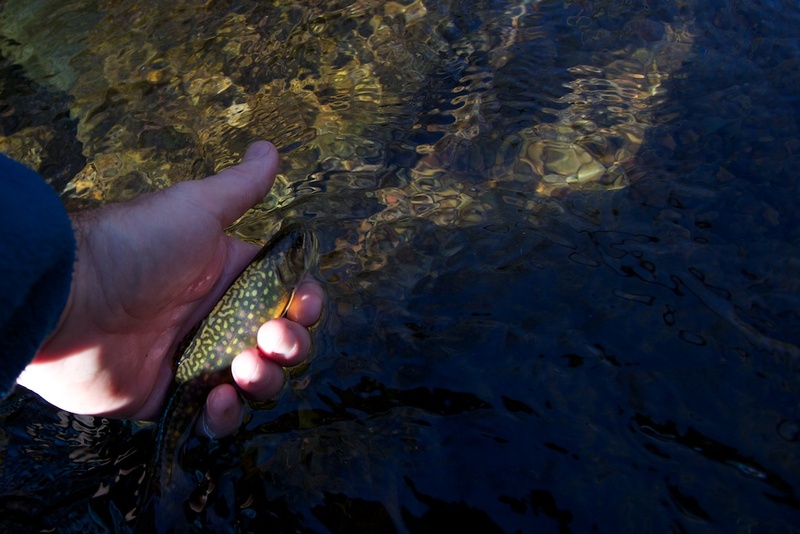 There are a lot of very small fish on the bottom and we don’t want to smush our future brook trout brood. The release. Lovely colors on these fish! My quest to catch at least one fish every month this year has begun. Preferably I’d like to catch a dozen fish each month. So far, I’m on track! what river was this at? I live near there? It’s on the east side of the park. That’s all I want to say. But I think any of those streams on the east or west side would have fished like that on a warm day in January.